Have you ever tried a bodybuilding post-workout supplement with goat whey protein? This ingredient is as underrated as it is potent – it gives your muscles a decent protein punch. It’s also in ONNIT Recovery Protein, the so-called “Ideal Post-Workout” which should impress you in this review. Unique ingredient combo. Hemp seed, bovine colostrum, goat whey protein isolate, coconut water, BCAAs, and creatine. Has good fats. Sunflower oil component helps boost heart health. Clean ingredients. Bodes well for your body. Directions For Recovery Protein: As a dietary supplement, mix three scoops of powder with at least 12 ounces of water or your choice of juice. What is your ideal bodybuilding post-workout supplement? Perhaps the traditional kind of post-workout is more up your alley. Something like Sheer Strength Labs SHEER RECOVERY, which has creatine, glutamine, and l-carnitine l-tartrate. On the other hand, maybe a post-workout which places a premium on carbs and protein such as MyProtein Hurricane XS suits your fancy. Whatever the case may be, make sure to capitalize on the crucial post-workout anabolic window. That’s when your muscle glycogen stores are running low and your muscles are pining for amino acids. 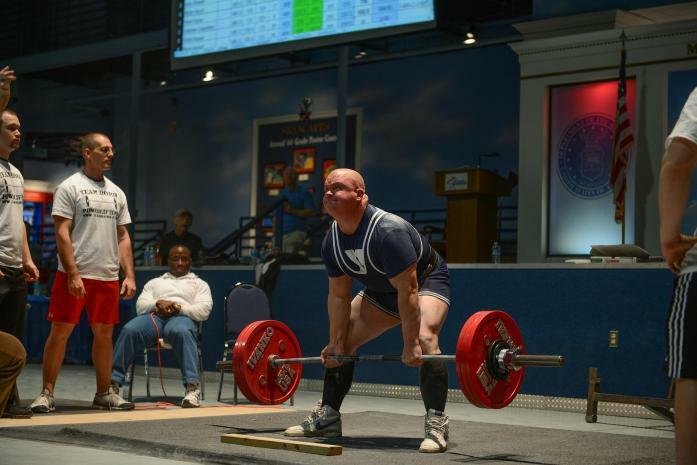 In fact, Dr. Dylan Klein of the National Strength and Conditioning Association recommends protein consumption “relatively shortly following training” for optimum results. Let’s see if ONNIT Recovery Protein is up to the daunting task.The manufacturer dubs it the “Ideal Post-Workout,” per its official website. We love the product’s marketing slogan (“Training Makes You Weaker. Recovery Makes You Stronger”). It’s simple, unique, and catchy. Moreover, it makes perfect sense: paying attention to your recovery is key. It will help you achieve your long-term fitness goals. Try ONNIT Recovery Protein for better results at the gym. We also commend the manufacturer for stressing the importance of the post-workout anabolic window. “The best trainers in the world will all tell you that you will only progress as much as you are able to recover. Adding the right nutrients are an essential part of this process,” per ONNIT Labs’ official website. We agree 100 percent. You should never take your post-workout supplementation and nutrition for granted. We’re confident ONNIT Recovery Protein will help you achieve your long-term post-workout goals. The focal point of ONNIT Recovery Protein is the Optimization Blend, which takes up 15 grams per 41-gram serving (three scoops). Unlike other post-workout blends, this one is simple: hemp seed and bovine colostrum are the main components. At first glance, the supplement facts indicate the Optimization Blend is proprietary (note the manufacturer doesn’t break down the exact amounts for hemp seed and bovine colostrum). However, ONNIT Labs’ official website says 10 grams of hemp seed and five grams of bovine colostrum comprise the Optimization Blend. We found that weird and confusing. It the company can indicate the precise amounts on its official website, it should do the same thing on the product label. Talk about inconsistency. The hemp seed component “provides (a) well-balanced protein profile to complement the other protein sources,” per the same source. Hemp seeds are rich in good fats, protein, and minerals. They have a well-rounded nutritional profile. They are also an exceptional source of omega-3 and omega-6 fatty acids. That means ONNIT Recovery Protein will help boost your heart health and ward off inflammation – two awesome post-workout benefits. Plus, omega-3 fatty acids also help boost vision. That’s an impressive bonus. In addition, more than 25 percent of hemp seeds’ calories are from protein. No wonder there are plenty of hemp protein supplements on the market. Hemp seeds also offer your body Vitamin E, phosphorus, potassium, sodium, magnesium, sulfur, calcium, iron, and zinc. They’re quite the nutritional powerhouse. We’re sure they will boost your long-term health. We have yet to see a post-workout supplement which features hemp seeds as one of the primary ingredients. ONNIT Recovery Protein is unique in that regard. It’s a great selling point, to say the least. This product’s bovine colostrum (the fluid which feeds a newborn animal) content also serves your body well – it helps improve gut health and regulate the immune system. Whey protein concentrate (WPC) is also rich in immunogloblulins, just like bovine colostrum. The former is an excellent source of amino acids. Here’s the thing: when you consume ONNIT Recovery Protein, it’s like chugging on a WPC supplement (although it doesn’t have WPC) because you get both protein and health-boosting immunoglobulins. If you want hard evidence bovine colostrum works, the British Journal of Medicine’s September 2006 issue (via NCBI.NLM.NIH.gov) concluded, “Low-dose bovine CPC (colostrum protein concentrate) supplementation was associated with a worthwhile improvement in TT40 (40-kilometer time trial) performance and a reduction in fatigue following a five-day HIT (high-intensity training) period” involving 14 male cyclists. We haven’t stumbled upon a post-workout which has bovine colostrum until now. ONNIT Recovery Protein continues to create a unique identity. 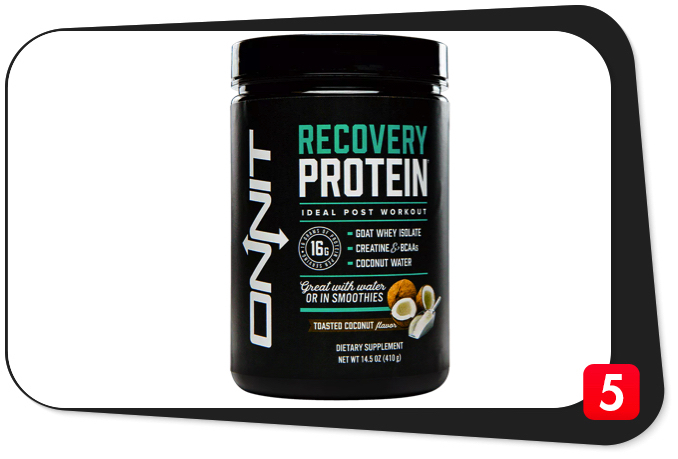 Get this: ONNIT Recovery Protein also has 10 grams of goat protein isolate per serving. We know of no other post-workout which has this. That’s about as non-conformist and non-traditional as it gets. “Goat whey protein has a complete amino acid profile ideal for nourishing tired muscles and is free of any hormones or additives,” per ONNIT Labs’ official website. Not only is goat whey protein a decent source of protein, but a 327-gram serving yields 33 percent of the daily value for calcium. A 271-gram serving also gives you 27 percent of the daily value for phosphorus. Plus, goat whey protein is easily digestible and is ideal for those who have allergies and lactose intolerance. In our opinion, this is another bona fide nutritional superstar. Next up are 10 grams of coconut water per serving. “Coconut water is known for its ability to pack a hydrating punch, and in this formula boosts the delicious toasted coconut flavor,” per the manufacturer’s official website. Coconut water is an ideal go-to after a hard workout (especially a cardiovascular workout) because it has an impressive electrolyte profile (particularly potassium). Your body is pining for electrolytes after a grueling exercise session – you need them for optimal hydration, fluid balance, and recovery. Thank heavens coconut water is around. The Journal of the International Society of Sports Nutrition’s January 18, 2012 issue (via NCBI.NLM.NIH.gov) says, “Both coconut water (natural, concentrated and not from concentrate) and bottled water provide similar rehydrating effects as compared to a carbohydrate-electrolyte sport drink” in exercise-trained men. With that, do yourself a favor and ditch those artificial-coloring-laden sports drinks now. Of course, no post-workout supplement would be complete without branch-chained amino acids (BCAAs).“These three amino acids (l-leucine, l-isoleucine, and l-valine) in the 2:1:1 ratio, are crucial for the synthesis and recovery of muscle tissue,” per the company’s official website. ONNIT Recovery Protein has 3.5 grams of BCAAs per serving. Using the 2:1:1 BCAA ratio as a guide, this means this product has 1.75 grams of leucine, 850 milligrams of isoleucine, and 850 milligrams of valine per serving. When you think about it, it isn’t all that much, considering it takes three scoops to complete one 41-gram serving of ONNIT Recovery Protein. For comparison’s sake, some post-workouts such as Advanced Molecular Labs Postworkout have five grams of leucine per scoop. It’s abundantly clear ONNIT Recovery Protein lags behind other post-workouts in terms of BCAA content by a mile. If it has only 1.75 grams of leucine per serving, it won’t do much for your muscle-building aspirations. Lastly, ONNIT Recovery Protein has one gram of creatine monohydrate per serving. “Creatine works. It helps the body with the synthesis of muscle fibers, helps support muscle health, and improves available energy output,” per ONNIT Labs’ official website. Creatine is a time-tested bodybuilding supplement ingredient. It’s one of the safest and most effective on the market. You can’t go wrong with it. On the other hand, we weren’t exactly enamored with the paltry creatine content of ONNIT Recovery Protein. The aforementioned Advanced Molecular Labs Postworkout has five grams of creatine monohydrate per scoop (the optimal daily amount for creatine). ONNIT Recovery Protein is light years behind. We like ONNIT Recovery Protein’s unique ingredient combo. However, we’re not so impressed with the dosing. Nonetheless, we’re confident it will make an impact on your post-workout aspirations. Calories, 170: Many post-workout supplements which don’t stress protein and carbs have between zero and 150 calories per serving. Still, ONNIT Recovery Protein’s 170 calories per serving won’t compromise your fitness goals. Calories from fat, 45: This product has a higher fat content than most post-workouts. Most of it comes from sunflower oil, a source of good fats (which the heart needs). However, it’s also a double-edged sword: studies suggest it may have detrimental effects on the liver. Total fat, 5 g: This much represents eight percent of the daily value for fats, which isn’t too high (anything more than 15 percent is high). While most post-workouts have lower fat content, ONNIT Recovery Protein has an impressive arsenal of good fats (monounsaturated fat and polyunsaturated fat) which bodes well for long-term heart health. Total carbohydrates, 14 g: While 14 grams per serving may throw off some consumers, it isn’t high (A maximum daily value of five percent is low). ONNIT Recovery Protein is also low in sugars at just four grams per serving. The good news: it has stevia leaf extract, a natural, plant-based sweetener which helps regulate blood pressure and blood sugar levels. Protein, 16 g: Bear in mind many post-workout supplements do not have protein content. Consider 16 grams per serving a bonus. The duo of bovine colostrum and goat whey protein isolate is one of the most unique protein combos we’ve seen. We’re sure this tandem will give you a fast return on your investment. Calcium, 83 mg: ONNIT Recovery Protein’s calcium content is just mediocre at eight percent of the daily value. Iron, 1 mg: This post-workout supplement has so-so iron content at six percent of the daily value. Sodium, 55 mg: We’re glad ONNIT Recovery Protein doesn’t go overboard on the sodium content at a measly two percent of the daily value. This much is safe for those who are monitoring their sodium intake. Hemp (seed), 10 g: Hemp seeds are nutritional virtuosos because of their solid fat, protein, and mineral profile. They help boost heart health, too. It’s rare to stumble upon a post-workout with this ingredient. Grab the opportunity. Colostrum (bovine), 5 g: The milk that feeds a newborn animal which helps boost the immune system and improve gut health. Goat whey protein isolate, 10 g: A unique protein source which has a complete amino acid profile, per the manufacturer. It’s also safe for those who have allergies and lactose intolerance. Coconut water, 10 g: Has an impressive electrolyte profile (especially potassium) which helps nourish your body after a hard workout. Branched chain amino acids (2:1:1), 3.5 g: A staple among post-workouts because of their ability to boost protein synthesis, repair muscle tissue, and increase endurance. However, we consider ONNIT Recovery Protein’s BCAA content as below average. Creatine monohydrate, 1 g: Another post-workout ingredient staple which has many benefits (increased muscle mass and athletic performance, among other things). Unfortunately, one gram per serving won’t cut it. After a thorough analysis, we consider ONNIT Recovery Protein as one of the most unique post-workout supplements we’ve ever reviewed. The unique ingredients speak for themselves. The hemp seed and goat whey protein isolate components give your body a good protein punch – the sooner you replenish with protein after hard workout, the better. You also get additional health benefits with hemp seed and bovine colostrum (better heart and digestive health, among others). Seriously, where can you find a rare post-workout combo such as this one? Top it all off with coconut water, you get a recovery formula which can give you serious results. A post-workout supplement such as ONNIT Recovery Protein can help you achieve your fitness goals. It’s just a shame the BCAA and creatine monohydrate content aren’t up to snuff. We’ve compared ONNIT Recovery Protein to more powerful post-workout formulas such as Advanced Molecular Labs Postworkout. The former falls behind by a mile in terms of BCAA and creatine content. It seems as if ONNIT Recovery Protein’s BCAA and creatine components are irrelevant. The manufacturer could have added more. Nonetheless, we the inclusion of sunflower oil – a rich and balanced source of omega fatty acids, hence the decent monounsaturated and polyunsaturated fat content. These bode well for your heart health. We also like the manufacturer’s use of stevia leaf extract. We already pointed out it has proven health benefits. This was a great move on the company’s part. On the flip side, the manufacturer’s transparency is a bit inconsistent – it doesn’t divulge the exact amounts of hemp seed and bovine colostrum on the ingredients label but does so on its official website. Weird, to say the least. Finally, ONNIT Recovery Protein is somewhat expensive at $33.96 for a 410-gram (0.9-lb.) container, which has just 10 servings. Many customers share the same sentiment. The takeaway: despite its shortcomings, ONNIT Recovery Protein is a product which will still help you conquer your fitness plateaus and achieve your post-workout goals. With the exception of the mediocre creatine content, we agree with most of these claims. ONNIT Recovery Protein can help you achieve your post-workout goals and then some. The manufacturer intended ONNIT Recovery Protein for healthy and active individuals who are at least 18 years of age who want to shorten recovery time, increase muscle mass and energy, boost hydration, and achieve their daily fitness goals. ONNIT Recovery Protein has no glaring side effects. However, if any of the ingredients make you feel doubtful, please consult your physician before buying this product. Has hemp seed. Helps improve heart health and meet one’s daily protein requirements. Goat whey protein isolate. Decent protein source safe for those with allergies and lactose intolerance. Coconut water. Best way to rehydrate after hard workout because of electrolyte content. Has good fats. Sunflower oil content contributes to cardiovascular health. Has stevia. Natural plant-based sweetener with proven health benefits. Low sugar content, too. Clean ingredients. Always a must whenever considering any bodybuilding supplement. Mediocre BCAA and creatine content. 3.5 grams and one gram per serving, respectively. Inconsistent transparency. Ingredient label and information on company website don’t match. Expensive. $33.96 for a 410-gram (0.9-lb.) container. It bears repeating: ONNIT Recovery Protein is one of the most unique post-workout supplements on the market. Try recovering with hemp seed, bovine colostrum, and goat whey protein isolate, and see the difference for yourself. It’s not a perfect product. However, we recommend you give it a shot. Otherwise, there are plenty of cheaper post-workouts out there with more creatine and BCAA content.